Definition at line 64 of file CMathDependencyNodeIterator.h. Definition at line 12 of file CMathDependencyNodeIterator.cpp. Definition at line 20 of file CMathDependencyNodeIterator.cpp. Definition at line 28 of file CMathDependencyNodeIterator.cpp. 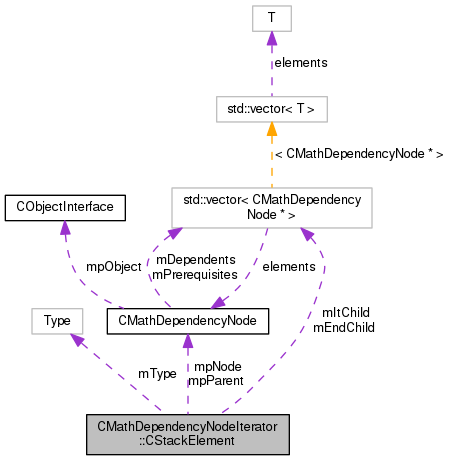 References CMathDependencyNodeIterator::Dependents, CMathDependencyNode::getDependents(), CMathDependencyNode::getPrerequisites(), mEndChild, mItChild, mpNode, mType, and CMathDependencyNodeIterator::Prerequisites. Definition at line 54 of file CMathDependencyNodeIterator.cpp. An iterator pointing beyond the last child. Definition at line 109 of file CMathDependencyNodeIterator.h. Referenced by CStackElement(), CMathDependencyNodeIterator::increment(), and CMathDependencyNodeIterator::skipChildren(). An iterator to the next child to be processed. Definition at line 104 of file CMathDependencyNodeIterator.h. Definition at line 94 of file CMathDependencyNodeIterator.h. Referenced by CStackElement(), and CMathDependencyNodeIterator::increment(). Definition at line 115 of file CMathDependencyNodeIterator.h. Definition at line 99 of file CMathDependencyNodeIterator.h.